Beijing (13 Jan – 10 Mar 2019) Limb Eung-Sik was not only a well-known and pioneering Korean photographer, but also an administrator, educator and critic, who made great contributions to the establishment of the theory and artistic substance of photography as a thread of Korean art. Limb Eung-Sik (1912-2001), was not only a well-known and pioneering Korean photographer, but also an administrator, educator and critic, who made great contributions to the establishment of the theory and artistic substance of photography as a thread of Korean art. As a figure of Korean photography and a witness of South Korea’s dramatic changes through the 20th century, Limb’s works have both an aesthetic and historical value. The exhibition, which covers most of Limb’s 50-year long photographic career, introduces Limb Eung-Sik both as artist and with texts on the history of Korean photography, little known by an international audience. It also examines the role of Limb in the history of modern Korean art, instrumental in lifting the status of photography from documentary technique to art. As an advocate of photography, Limb Eung-Sik brought New York MoMA’s legendary exhibition “The Family of Man” to Seoul’s National Museum of Modern and Contemporary Art (MMCA) in 1957, which was credited as the first major photography exhibition in Korea. Limb was the first-ever Korean photographer to hold a show at a national museum, in 1982 at the MMCA. Before the Korean War (1950-1953), since the Imperial Japanese rule (1910-1945), Korean photographic works were mainly painting-like artistic photography or examples of pictorialism. Having been a war photographer during the Korean War, Limb Eung-Sik, who was born in Busan but grew up in Japan, became interested in realistic photographic techniques, later advocating a genre of photography called ‘life-centered photography’ – a form of humanistic realism, expressing the realities of society and everyday lives – which became very popular after the war. Limb argued that ‘the artistry of photography depends on its honest representation of reality, and thus only good documentary photographs deserve to be considered as examples of true photography’. (quote from the catalogue of the exhibition Photography of Limb Eung-Sik at National Museum of Modern and Contemporary Art, Korea in 2011). This exhibition features a selection of 20 photos by Limb Eung-Sik from the collection of The Museum of Photography, Seoul, starting in the 1930s, when, influenced by pictorialism, he experimented with style using his first camera, a middle school entrance gift, to his war photography of the early 1950s and his post-war photography that attempted to provide objective representations of social phenomena and the momentariness of everyday existence. 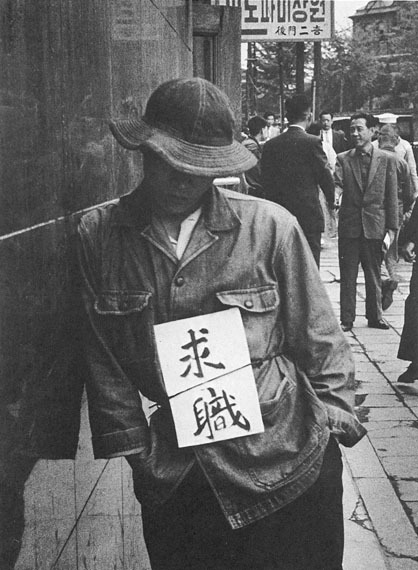 His portraits of Koreans of the times, exhausted by social circumstances but striving to earn a crust, is well evidenced in one of Limb’s most iconic images, Job Hunting (1953), while the survivors from the heavy shelling of the war are represented by a single bare tree in his Naked Trees (1953). Born 1912, Japan. Died 2001, South Korea. Limb Eung-Sik is now regarded as one of the most important figures in the history of photography in South Korea. Having started as an amateur photographer, he first focused on pictorialism as part of the Busan Photography Association and Kangreung Photography Association during the Japanese colonial period (1910-1945). Following the Korean War (1950-1953) as a war photographer, Limb Eung-Sik became interested in the realistic photographic recording of facts, and later advocated a genre of photography called ‘life-centered photography’ – a form of humanistic realism, expressing the realities of society and everyday lives – which became very popular after the war. As an advocate of photography, Limb Eung-sik brought New York MoMA’s legendary exhibition “The Family of Man” to Seoul’s National Museum of Modern and Contemporary Art (MMCA) in 1957, which is credited as having been the first major photography exhibition in Korea. Limb was the first-ever Korean photographer to hold a show at a national museum, in 1982 at the MMCA.